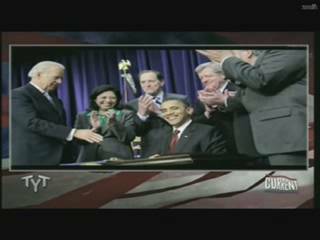 Cenk Uygur: Now we are in a segment called Cenk’s Hit List, where we are going to talk about some of the most interesting stories of the day as it relates to politics. The first one is about Progressives being dissatisfied with Democrats overall and President Obama. Jonathan Martin of Politico wrote a story about this and they actually did a little video of the story as well. Let’s show you that. 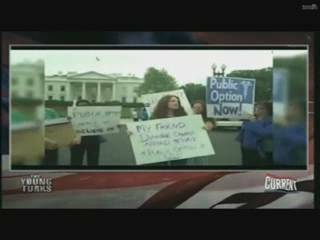 [Video] “’The President is facing a backlash from the left this morning. ‘I will not work for him again if he abandons the public option’. ‘I am trying to figure out if I have already been triangulated or if there is a way to untriangulate this situation’. Okay, now I am going to bring in Sam Seder, who is the host of the show, Majority Report, to help me with these stories. Sam, I think Politico might be onto something about Progressives being a little disgruntled. It is funny that they have just now figured it out. But what’s your take on this. Is it going to affect the election? And how disgruntled are they? Is it normal? Hey, look, no President gives you exactly what you want. Or is it something a little extraordinary? 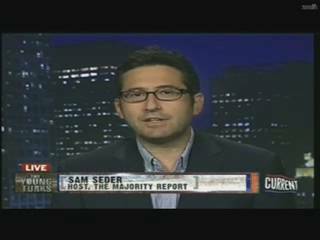 Sam Seder: Talking specifically about progressives who are concerned about populist issues I think there’s a real concern at least among activitists that the President and the Democratic Party are too eager to sell away things that are important to the middle class. And frankly there’s a real concern—I think it’s a legitimate one—that corporate money has infected the Democratic Party far more than it is tolerable. We got things like the Grand Bargain, the idea that maybe we are going to be cutting social security come the lame-duck session; things just like the transpacific partnership, where at least we are seeing about 130 House members now who are saying, hey we want to see this NAFTA plus essentially trade pact that the administration is negotiating in secret; issues like the bankruptcy cram down; the way that they handled the mortgage crisis; the fact that there’s been no accountability for banksters; and I’m not even getting to the civil libertarian aspects that progressives are upset about. We are talking about a wide range of issues where the President had a unique opportunity, and the Democratic Party had a unique opportunity, to go populist in 2008. And its clear they do not want to. You were talking about this in terms of the attacks on Bain with Romney, right? There’s actually no way that a smart politician like Bill Clinton can say, this isn’t going to help. We saw the Newt Gingrich hurt of Romney on this in South Carolina. The reason why they came out and said you should not attack Bain is because to a large extent this is their people: Bill Clinton and the financiers are pretty tight, and there is a lot of the Democratic establishment that is in tight with these people. Cenk Uygur: So, Sam, you got to the heart of the issue there because the Politico article talks about how populism might work. This might actually be a great time for populism. It is kind of weird that the Democrats are not doing it. But I think Sam is right. I thought it was a pretty good article overall, but I actually want to give you one funny line from it. 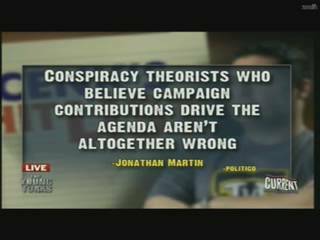 It says, “Conspiracy theorists who believe campaign contributions drive the agenda aren’t altogether wrong.” Really?! Ha, Ha, Ha. It’s hard not to laugh at that. Sam Seder: Well, the other half of that is, Sheldon Whitehouse I interviewed him on my show, he said to me, the other part of that is when a Corporation shows up in your Office, they may not contribute money to you to get to you to vote their way. They just show up and say, you know, we got 5 million bucks that we can dump into your district or into your state. And we will attack you if you don’t vote our way. So it cuts both way. And, yeah, of course. Cenk Uygur: No question, and I love these people who think these giant amounts of legalized bribery might actually affect the political votes are conspiracy theorists. Ha, ha, ha. Sam Seder: Who knew. Who knew. Ha, ha. Cenk Uygur: What? Of course. Of course it affects their votes. This entry was posted in Accountants CPA Hartford, Articles and tagged article about progressives dissatisfaction with Obama and Democrats, Bill Clinton and his financiers, Bill Clinton don't attack Bain Capital, campaign contributions drive the agenda, Cenk Uygur, Cenk's Hit List, corporations intimidating elected officials, Current TV, Democratic Party, Grand Bargain, Jonathan Martin, June 30 2012, NAFTA plus trade pact, Newt Gingrich, Politico, populism, Sam Seder, Sheldon Whitehouse, The Young Turks, transcript, transpacific partnership, video. Bookmark the permalink. One Response to Progressives are dissatisfied with President Obama and the Congressional Democrats overall. As a genuine progressive, I believe Their DEM Lying AYE$ !